Almond Joy Recipe | Fat Bombs! When you're craving something sweet, but don't want to fudge up on your perfect macros for the day, we like to turn to this Almond Joy Recipe! These little fat bombs store great in the fridge and have fat bomb macros so there is 0% guilt involved. If you love coconut, chocolate, almonds and making easy recipes watch Matthew walk you through this fat bomb recipe below! No Bake Almond Joy Fat Bombs! The best part about this recipe is there is no baking involved! All you have to do is allow the mixture and chocolate to set before digging in. Nothing needs to preheat, bake, or cool. No bake anything always entices me to make it right away. These are a great option to turn to in times of needing to up your fat without sabotaging your protein or carbs levels, wanting something small, but sweet enough to satisfy your cravings or even something fun to make with your kids! We've given you a great fat bomb base where you can change up flavors or add extras, like chocolate chips for extra flavor and fun! Personally, the only candy I ever want to eat out of assorted boxes of chocolates are the coconut ones. I want a box of coconut candy chocolates at all times! 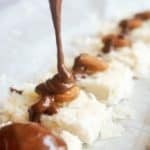 It's all about the texture for me, and the almond joy recipe we've made has that same chewy texture with a slight bite from the hardened chocolate and the almond joy on top! You also get to taste the individual flakes of coconut which is important in any good coconut candy! Almond Joy Recipe For Fat Bombs! With Almond Joy and Mounds being two of my favorite candies, I must say this is my favorite fat bomb recipe to date. All I do differently is leave off the almond since I am allergic, and I would personally even opt for vanilla extract over almond extract. All that being said, these chewy, chocolate, perfect macro fat bombs have won me over! You can also give our Chocolate Peanut Butter and Coconut Fat Bombs a try. However, before all else I would recommend making this almond joy recipe! Recipe can be quickly added to MyFitnessPal - Search "KetoConnect - Almond Joy Fat Bombs"
Heat a saucepan on low heat and add coconut milk to the pan. Add in the coconut oil and coconut flakes, and stir letting it cook down a bit. Add in stevia drops and almond extract, stir and let it cook on low for 5 minutes. Add in xanthan gum and stir. Line an 8x4 loaf pan with parchment paper and pour the coconut mixture into the pan. Press it out evenly over the parchment paper (1/2 inch thick) and let set in fridge for one hour. Pull out the parchment paper and cut the coconut bar into 12 even pieces. Optional: Place an almond on top and gently press down into center. Chop the chocolate up and add to a microwave safe bowl. Add the coconut oil and stevia to the bowl and microwave until fully melted. Pull the almond joys out of the freezer and dip them into the chocolate coating either fully or partially coating them.